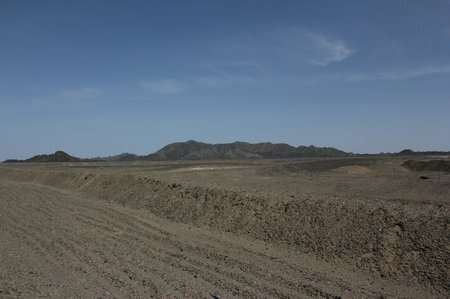 The desert landscape was mesmerizing, hour after hour of rough, rocky, flat, hot desert. We passed a wind-farm that seemed to go on for miles. A couple of times we passed new toll plazas gating the entrance from small towns with a few unpaved streets to the highway on which our bus was traveling. 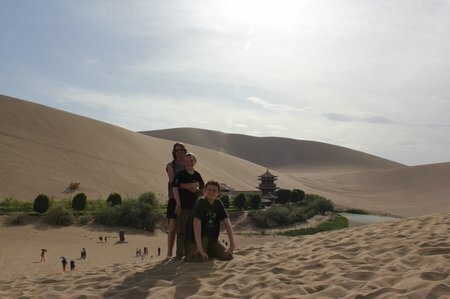 We really liked Dunhuang. 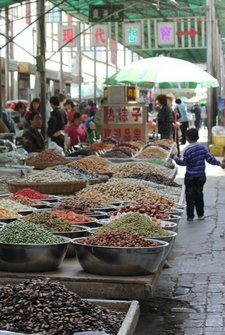 The streets are paved with wide sidewalks and the market is orderly, clean and covered. There are plazas with cafes and an open-air night market where you can eat pretty cheaply and in comfort since most of the stalls have tables and chairs set out for customers. None of which explains the lackluster description in Rough Guide and Lonely Planet unless it’s not “authentic” enough any more. We relaxed and wandered the tidy streets. In the heat of the day we played Jenga in a cafe and wrote postcards. In the evening we rented bicycles and went out to the Singing Sand Dunes. The paved, tree-lined roads with a bike path on either side felt odd for a Chinese city but wonderfully safe – even if none of us had helmets. At Mingsha Shan the reason for the paved roads and un-Chinese infrastructure in Dunhuang become more clear: the city seems to be a very popular destination for Chinese tourists, and you have to pay a hefty 150yuan just to enter the Sand Dunes area. Inside, you can rent bright orange sand boots, ride a camel, ride a dune-buggy, or even take a private plane ride – all for additional fees. No wonder the city has money to put up street lights and keep the streets and sidewalks clean and paved. 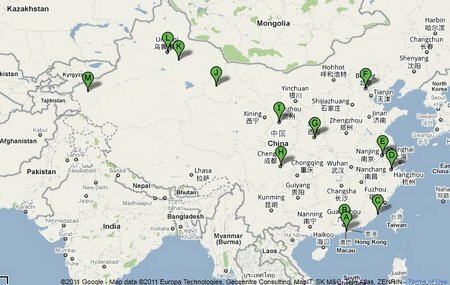 There were park fees for pretty much every attraction we visited in the Dunhuang area over the next few days. I’m not complaining, none of the individual fees were exorbitant and the improved infrastructure did make our visit more pleasant – it was just different for China.